MAHAGAMI campus has cozy cottages and spaces for learning various art forms linked through asymmetrical pathways amidst trees. ‘Sadhanalaya’ (learning spaces) for Kathak, Odissi, Vocal music and instruments are aesthetically designed and equipped with large mirrors, audio system and instruments. A library with a collection of more than 1000 books on a variety of topics related to dance, music, mythology, heritage, philosophy, literature, etc and a good collection of audio and video recordings of great artists is available for students. 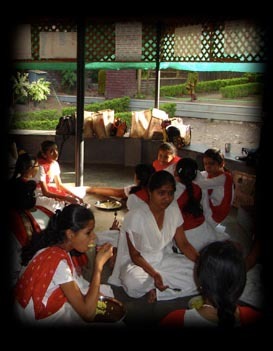 ‘Parnakuti’ – the dining cottage has a kitchen with all modern amenities which can be used by the inmates.